Wind, water and waves were key ingredients on September 19, 2015 as Indian Harbor Yacht Club provided a picturesque backdrop for a race of classic yachts visiting Greenwich, CT from across the East Coast. 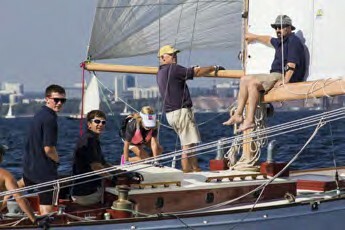 The race was their 6th Classic Yacht Regatta. 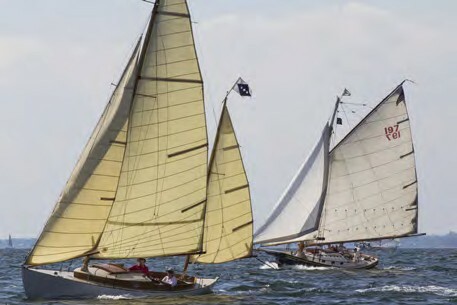 The event is the second regatta in Western Long Island Sound for classics that is part of the Long Island Sound Classic Yacht Regatta series. This year, a record 39 boats participated ranging in size from 18-foot Marshall catboats to the 90-foot Spirit of Tradition designed yawl Bequia. They also ranged in age, with most of the fleet being built in the 1920s through 1950s. Classic yachts have a different look and feel from today’s sleek, modern boats. While every boat has its merits, the owners and sailors of classics have a romantic appreciation for design, preservation and history. Watching them plying through the waters off Captain Harbor under full canvas, one could distinguish them quickly by their bright, highly varnished woodwork. Wood, varnish and bronze provide a richer texture than boats made of fiberglass, carbon fiber and wire rigging. And while modern boats are often designed to sail flat, the long overhangs of a classic heeling in a stiff breeze evokes images of sweeping elegance. That heeling ability also delivers a practical advantage of extending the waterline to create acceleration through the water. It is no wonder that heavier air typically suits classics. Race day weather, however, brought a bit of a challenge. After the Skippers Meeting in the clubhouse, the breeze was light and Principal Race Officer Ray Griffin announced a delayed start in hopes the wind would build enough to allow for a race. The subsequent classes of medium sized classic yachts, including the two John Alden designs Aegir and Windemere and the 1920s Herreshoff-designed S-Boats followed suit out on the 17-mile racecourse and were able to close the gap on the early, larger leaders. 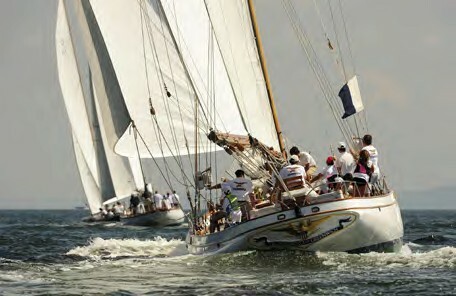 Meanwhile, the smaller classics and Spirit of Tradition boats raced an 11 mile shorter course closer to Greenwich Point. A special moment in racing occurred when both fleets converged on the last turning mark at the same time to create an exciting scene of sails, shapes and sizes all charging through the much-anticipated afternoon southerly, while the nine 30-foot one-design Shields fleet held a series of short triangle races using spinnakers inside Captain Harbor. With all racers in, the boats filled the clubhouse docks and the awards party went into full swing with Dark ‘n Stormies from Gosling’s. Prizes were given out in each class in additional to trophies for overall winners Dagger, Golden-Eye and Puffin. Additional awards were announced, including a Spirit of Panerai Award presented to Ticonderoga for her excellence of preservation and joyful participation that included allowing the junior sailors onboard to skipper during the race and to swing from her lovely halyards after racing. The regatta’s closing event followed this theme of sharing, with Indian Harbor Yacht Club once again hosting Yale-New Haven Hospital cancer patients and their caregivers out for an afternoon on the water in collaboration with the Sailing Heals organization.